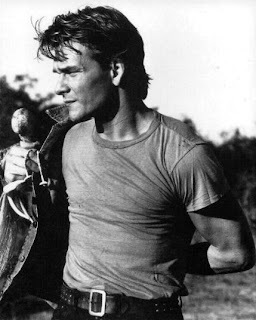 Patrick Swayze once owned a ranch one town over from where I grew up in northwest Houston. His mother, Patsy, was the dance instructor to my best friend’s little sister. I always thought I’d run into him one day at the Circle K or something, which is basically what happened to a high school friend of mine one summer. It was after our first year of college, and I was hanging out with this friend, Jason, every day. It was wretchedly hot as usual, and we were bored out of our minds. We spent half the summer selling Cutco knives and didn’t make a dime. We played Trivial Pursuit so much that we noticed we began to repeat the same questions. I took Spanish classes at the local community college just to break up the monotony. Both of us fancied ourselves too sophisticated–after a whole year of college–to be back in our backwater hometown, and we spent a lot of our free time either watching Almodovar movies or driving 30 minutes into the city just to hang out at this gelato place. Gelato–and not plain ol’ ice cream–complemented our newly-acquired, worldly attitudes. When it was clear we weren’t going to make any money selling knives to church ladies, I started temping at a paint company and Jason went to work at a local Eckerd’s in the photo lab. One day, Patrick Swayze, poured into a tight pair of jeans, walked into the drugstore to pick up some photos. “The name’s Swaaaaaaaaaaaayze,” he said. Jason wouldn’t acknowledge that he recognized the movie star, the one tiny toehold of power a non-famous person has with a famous person. In his account of this chance meeting, my friend described Patrick Swayze as a real “cheeseball,” for no specific reason. And the thing is, Patrick Swayze was cheeseball. Nearly all of his most memorable roles involved him taking his shirt off. His generous head of hair was always too coifed. He moved like a male stripper (and in some roles he was oiled-up like one, too). The way he and Demi got it on around that muddy potting table in Ghost–while she sculpted a laughably phallic hunk of clay–was just so icky. But it worked somehow. Maybe because Swayze came across as a rock of a man. He played mentors over and over again–whether it was the older brother (The Outsiders, Red Dawn), the teacher (Dirty Dancing), the protective lover (Road House, Ghost), or the leader of the pack (Point Break, To Wong Foo…). There was something aggressively Alpha about him, even though he could dance on his toes. He always played the guy who kept things together. He made movies that were mainstream and entertaining, and he wasn’t “cool,” except in a kitschy way. He was ice cream, not gelato. Nuthin’ fancy, but something you’d always enjoy returning to–even after a steady diet of snobbery and pretension–something uncomplicated, constant, and comforting that never failed to provide pleasure.